Phytosterols are natural components of many vegetables and grains. Preliminary scientific evidence suggests that plant phytosterols may help maintain cholesterol levels already within the normal range when consumed as part of a low cholesterol dietary program. 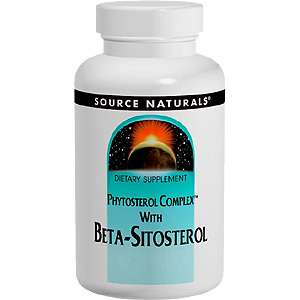 The three main phytosterols in this product are beta-sitosterol, campesterol, and stigmasterol. They are derived entirely from plant sources. Source Naturals Beta Sitosterol is suitable for vegetarians: contains no yeast, dairy, egg, gluten, or wheat. Contains no sugar, starch, salt, preservatives, or artificial color, flavor or fragrance. 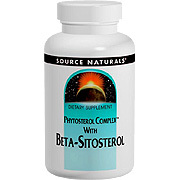 3 Beta Sitosterol tablets daily just before or with meals (not after). Soybean Hull (Phytosterol Complex) 850 mg, Yielding: Total Sterols 680 mg, Beta-Sitosterol 340 mg.
Other Ingredients: Microcrystalline cellulose, dibasic calcium phosphate, sorbitol, stearic acid, colloidal silicon dioxide, magnesium stearate and modified cellulose gum. Beta Sitosterol is shipped in a discrete, unmarked package. Orders are processed immediately and usually take about 3 to 5 working days to be received. We do ask that you try it for 2 to 3 weeks to feel the full effects. Any information received is used only for order processing and shipping purposes. Your information, such as e-mail address, will never be disclosed to a third party.